Arizona state legislators are once again positioning themselves to be the most hate-based state in the union. 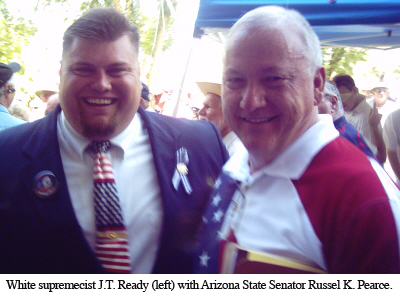 Arizona State Senator Russell K. Pearce (R) is a perfect example of hate mongering and overt racism. I realize that terms like "hate monger" and "racist" are strong accusations but I can find no better terms to describe the current attempt to curb illegal immigration in the state of Arizona. "Republicans and Democrats in DC are terrified to oppose illegal immigration out of fear that they will be labeled racist. This assertion is ridiculous. There is nothing racist about upholding the law." Senator Pearce's proposed legislation (SB1070) has nothing to do with upholding the law and everything to do with racial discrimination. According to Jennifer Allen, executive director of Arizona based Border Action Network who is working to defeat the bill, local law enforcement must make the eradication of undocumented immigrants a priority over other public safety responsibilities. Without any form of training, local law enforcement will be given authority to arrest someone if they have probable cause to believe they are undocumented. Who do you think they will suspect? This construct sets up a blatant system for racial profiling. The nearly 2 million Latinos in the state of Arizona will become prime suspects solely based on ethnicity. The bill's discriminatory tactics include attacks on day laborers and individuals that hire them as well as anyone who may transport, know, harbor, shield or protect undocumented immigrants. The bill represents nothing short of a witch-hunt with impunity. It sets up a system of law enforcement abuse that will drive immigrants, legal or not, deeper into the shadows of society. When I was a child, I was out for a walk with my mother in a rural part of south San Diego County. We lived within walking distance of the U.S. Mexico border. This particular morning, like many others, I ran ahead to investigate the seasonal creek several hundred yards away. When I came back to meet up with my mother she was nowhere in sight. I looked everywhere and quickly ran home to tell my father. My family spent 24 hours searching for her -- calling everyone we knew including law enforcement. The next morning we received a telephone call from Tijuana, MX. My mother had been picked up by U.S. Border Patrol and deported. When I ran ahead of her, a Border Patrol agent suspected my mother was in the U.S. illegally. She tried to convince the officer that she was "legal" but he didn't believe her. My mother had deep brown skin and spoke poor English but had lived in the U.S. as a legal resident for 25 years. She had raised four children but was deported because of her ethnicity. It was a horrible case of racial profiling that scarred my mother and family for life. J.T. Ready has publicly campaigned for Senator Pearce and has close ties to Neo-Nazi organizations. J.T. Ready has publicly stated, "I firmly believe in having a minefield across the border, this is 100% effective." Senator Pearce did not return calls to comment on these associations nor has he denounced them publicly. Both Galeener and Ready have been monitored by the Southern Poverty Law Center and the Anti-Defamation League and are classified as nativists, extremists and white supremacists but Senator Pearce remains silent. Jennifer Allen of Border Action Network has collected and sent over 20,000 postcards to Arizona Governor Jan Brewer opposing the legislation, yet the governor continues to support the bill. The bill is opposed by the Arizona Association of Chiefs of Police and dozens of Latino organizations and civil rights groups, yet the bill continues to make progress in the legislature. Scholars, lawyers, and fellow legislators believe Pearce's push to rid the state of undocumented immigrants violates basic civil rights and constitutional law, yet the bill has strong Republican support. Hate crimes against Latinos are up 40 percent, yet John McCain and his primary challenger JD Hayworth claim they are tough on undocumented immigrants and neither of them have the courage to denounce the racially motivated legislation.